Holiday Hours, New BOM, End of year and more. We are nearing the end of the year quickly, Are your ready? We have some quick gift ideas if you need a way to use up scraps or make something special. Holiday Hours are pretty simple We will be closed December 24th, 25th,26th and January 1st. Next Wednesday December13th will meet for our last handstitching club for the year. I will be doing a demo on how to use silk ribbon in emboirdery or punch needle. Show and tell is always welcome. Our Thymes of the Past BOM wool project are ready for pick up. You May pick these up at any time during regular store hours. In January we will be starting a new BOM Called Bristol Creek. This queen sized beauty has so many possibilities. I will be sharing blocks from this quilt soon. Sign up starts now. To register you will want to call or stop in. Registration will be $30. A monthly fee of 22.50 plus tax each month. 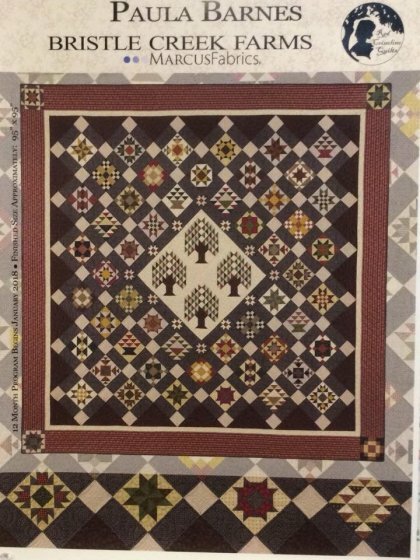 This is a twelve month program and includes everything you need to make this quilt top and binding. We will be turning ours into a family heirloom come check out how.